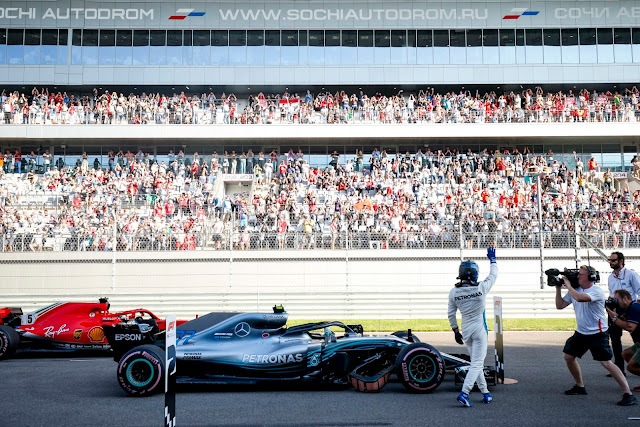 Matt 'Trumpets' Ragsdale gives us the lowdown on the events leading up to and trhoughout qualifying for the Russian GP. Glorious sunshine and clear blue skies dominated the pitlane of the 2018 Russian Grand Prix as the runup to qualifying commenced. But if FP3 was any clue, the most exciting thing about the weekend will have been the reintroduction of the Russian Rocket (or Torpedo, eh Seb), Daniil Kvyat, stepping back into Toro Rosso after spectacularly self-destructing in the very same team following his demotion from Red Bull in favor of Max Verstappen. Depending upon who you listened to it was due to either Kvyat bringing knowledge from Ferrari, budget from new Russian sponsors, and/or a total lack of superlicense qualified drivers in the Red Bull junior program. Or, if that wasn't exciting enough, you could also go with Ferrari's MASSIVE technical update, some of which was reverted overnight as they found their new rear suspension not working at all as planned, which resulted in a late night for, you guessed it, Daniil Kvyat in the Ferrari simulator setting up the car, hours before he was confirmed in his new seat at Toro Rosso. A ray of sunshine for Honda, whose upgraded PU performed well in the hands of Gasly, although the decision was made to revert and make some changes to optimise the PU to the chassis a bit more. As a result, both Toro Rossos will be dinged for a grid penalty, along with both Red Bulls and Alonso, because, of course, McLaren, whose radical low downforce package saw them at the bottom of the timesheets. The hole left at the front of the grid by the absence of Red Bull will be of great interest to HAAS, Renault and Force India as they fight it out for the top of the Formula B championship. Or is it Formula 1.5? Opinions differ.... At any rate, with Leclerc stuck in at P7 playing spoiler, it was Ocon, Magnussen, Perez and Sainz in that order, covered by less than 0.2 seconds, with Renault looking to be having a bit of a struggle. Regardless, the expectation is that both Red Bulls will be able to catch them and overtake, but the back of the midfield can be a treacherous place and stealing some extra points will be the top of the agenda for those competing for the best of the rest. Green Light!! Stroll was first out of the gate, trailed by Magnussen and Sirotkin. Grosjean followed, not too far behind as the rest of the runners waited for what they perceived as the optimum moment to strike. Ferrari was next out, Raikkonen leading Vettel, then the Toro Rossos headed out to set their official time to be clear of the 107% cut off. Stroll was on it and from the early runners it was K-Mag who took the honours for S1. As they hammered into the middle sector, Raikkonen and Vettel were well into it, taking the purple away from K-Mag, who wound up best of the rest from the early runners. Stroll was wide at T8 leaving him 4 seconds off and no doubt cooling his tyres for another bite at that particular apple. Vettel to a 1:33.534 and to the top, with Kimi about 0.27s behind. K-Mag's time was just 0.2 seconds back of Raikkonen, and he was trailed by Gasly and Leclerc, until Perez flashed across the line to go P5 only to be outdone by Ocon in P4. It was roughly 0.2 seconds again separating the HAAS from the Force India. 10 minutes to go and the Mercedes were finally on track and it was Bottas with a faultless run, a 1:33.17 to take P1 whilst Hamilton had an issue in S3 and languished in P10 as Ferrari decided to give it another go. P2 for Raikkonen with a 1:33.341, reducing the gap the top somewhat, and Vettel slotted in neatly behind him. 7 minutes to go, and down to P11 for Hamilton, as Perez edged his teammate on their second runs, up to P5 and just 0.01 seconds off Magnussen. Hamilton rocked up on his second effort and purpled the board, all three sectors and the end result was a 1:32.825. 5 minutes to go and Sirotkin, Vandoorne, Stroll, Verstappen and Ricciardo were all on the outside and looking in, though neither Red Bull had yet to set a time, a problem quickly remedied as they rolled onto the circuit to set an official time and qualify for the race. 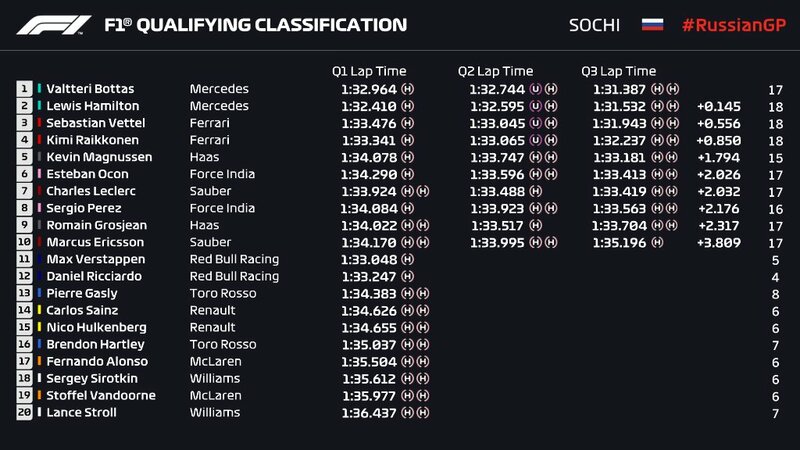 Given they were likely to exit the bottom 5, Alonso and Hartley were the other two runners with some work to be done as the teams reset for their last efforts to attain the promised land of Q2. Ricciardo P3 and Verstappen P4 seemed to show a fairly large amount of track evolution, as Grosjean, too, managed to move ahead of his teammate. Under 2 minutes and Lewis, after an amazingly slow cool down lap, killed it with a 1:32.41 as Mercedes looked rather dominant (words I was sincerely hoping not too type) as Q1 rolled to a close. Hartley, Alonso, Sirotkin Vandoorne and Stroll were all on it, but it was Hulkenberg trying to improve who drew attention with his torrid effort, litter that failed to improve his time. Sirotkin with a yellow and out, Sainz managed to put his teammate on the bubble, down to P15. Hartley was improving, but caught by the spin of Sirotkin bailed on his lap, sparing Hulkenberg the ignominy of being out in the first qualifying session. On the outside looking in were Hartley, Alonso, Sirotkin, Vandoorne and Stroll, off for some borscht as the rest turned it around, Sirotkin's spin having ruined the excitement at the end of Q1 by compromising several good laps. Not affected and with an eye opening run was Leclerc, up to P7 and best of the rest. AS the second session opened, Ricciardo was out of the car and looking to be done with his day, opening the door for some of the midfield teams to ascend to the rarefied air of Q3, not always an advantage for those teams as they lose tyre choice for the start of the race, a hard earned lesson from Singapore. Bottas was first off after the pitlane opened, then Hamilton. After a 30 second gap, off went the Ferraris followed by Ocon. That was that as Valterri got his lap underway, purpling the first sector until Hamilton came through, looking to be a pattern. Neither Ferrari could manage the same feat, but they were only down by hundredths. Losing time again in S2 with Raikkonen ahead of Vettel but it was the third sector that was proving their bête noire, chunking huge amounts of time through the more technical section, with all of the top 4 setting their times on the rather more durable Ultrasoft tyre. Best of the rest was Leclerc, as HAAS emerged for their traditional middle of the session run, with Ocon and Perez about 0.25 seconds off the Sauber. KMag led the way for HAAS and P8 was the best he could do, as RoGro rocked up to just a tenth off Leclerc. Neither Gasly, Sainz nor Hulkenberg had set a time and it began to look as if none of them would for reasons of strategery as starting P11 would allow them to start on the more durable tyre, which worked out very well in Singapore. 2 minutes to go and it was just the top 10 who were out, minus Leclerc and Grosjean, who presumably were happy with the balance of their car. Both Mercedes and Ferrari were out on the Hypersoft to fine tune the balance and for the drivers to attune themselves to the feel of the tyre before Q3. IT was Mercedes again looking fierce, with Hamilton crushing all 3 sectors until he hit the final turn, where he ground to a halt so as not to top his time on the Ultrasofts. Off in search of some vodka were Verstappen, Ricciardo, Gasly, Sainz and Hulkenberg, the latter 2 with the prime P11 and P12 spots. The remainder got ready to do battle for the ultimate palmares of Q3 with the biggest question being whether Vettel could split the Mercedes and if either HAAS could get in front of the flying Sauber of Leclerc. Ocon led the way into Q3, followed by Bottas and Hamilton. Raikkonen, Perez and Kmag were next, followed by RoGro. A bit of a gap then Vettel and Leclerc were the lanterne rouge of the outlap. 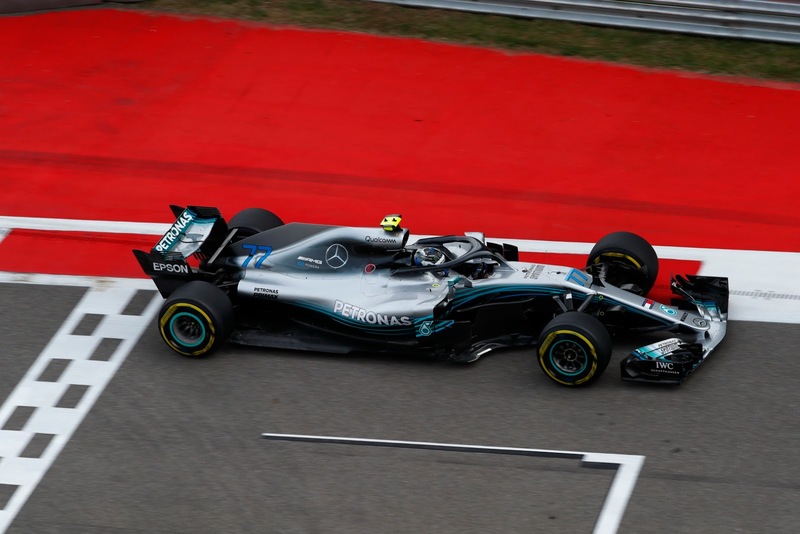 Lewis' outlap was significantly slower than Bottas, and it was a bit of a twitch for Bottas as he exited the final turn at full speed to set off on his first hotlap. To the surprise of no one, Hamilton continued his dominance and best of the rest was Leclerc up by a tenth through S1. Troubles for Hamilton in S2 where he lost 3 tenths to his teammate. He came back in S3 but it wasn't quite enough and as the dust settled it was Bottas on provisional pole by a terrifyingly small .004 seconds, and Ocon was P5 leading Leclerc by a similarly tiny margin, 0.006 seconds. Well, at least there was something to watch for in the final runs... Vettel slotted 3rd, but 0.6 seconds down, which increasingly looked to be the best Ferrari were going to achieve on the weekend. After the interval, out they all went, Bottas again leading the way to Hamilton. Ocon was the first of the midfielders, trailing Hamilton and then Vettel and Perez behind. Off went Bottas, personal best but not enought to knock Lewis off the S1 pedestal. Hamilton, on the other hand rolled up an extra 3 tenths in that sector as he rocked through. Bottas purpled S2 and as he entered the third sector, suddenly that was it. Lewis had lost a staggering 0.7 seconds having run wide and he aborted his lap. Behind, Raikkonen was also mighty and he looked to have the better of Vettel until the final turn, when he had a lurid slide which cost him P3 on the grid. KMag had meanwhile taken the best of the rest pole, up by 0.25 seconds on Ocon. With the big boys all done all eyes were with Leclerc, looking fast but ultimately still lacking some pace in his Sauber, slotting in P7 as he crossed the line, behind both Kmag and Ocon. Perez, Grosjean and Ericsson rounded out the top half of the field and the strategic implications of tyre choice were clearly going to be the motivating factor in the battle for the midfield title.